9 pieces arranged as a suite with an option to divide the music into two shorter suites. The first performance of the musical stage play 'The Fairy Queen' - based on Shakespeare's 'A Midsummer Night's Dream' - took place in April 1692 at the Dorset Gardens Theatre in London, with incidental music composed by Purcell. 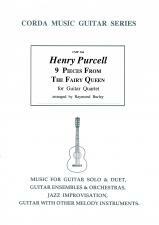 The present selection of pieces represents a small portion of Purcell's contribution to the play; with the guitar quartet arrangements I have attempted to present movements that are contrasted in character and, most importantly, sound convincing in their new format. Suite 2. Entry Dance, Air, Dance for the fairies, Hornpipe, Chaconne.